This week my husband and I take to the highway for a four show swing through the west. Since we are spending a few days playing around Deadwood, SD my husband has been calling this trip "The Aces & 8's Art Tour." Aces and 8's were the hand Wild Bill Hickock had when we was fatally shot in Deadwood. For you history buffs, I did change my cards from those Hickock actually held. His set of cards has been called a dead man's hand and I wanted something a bit more positive and lucky for our adventure. 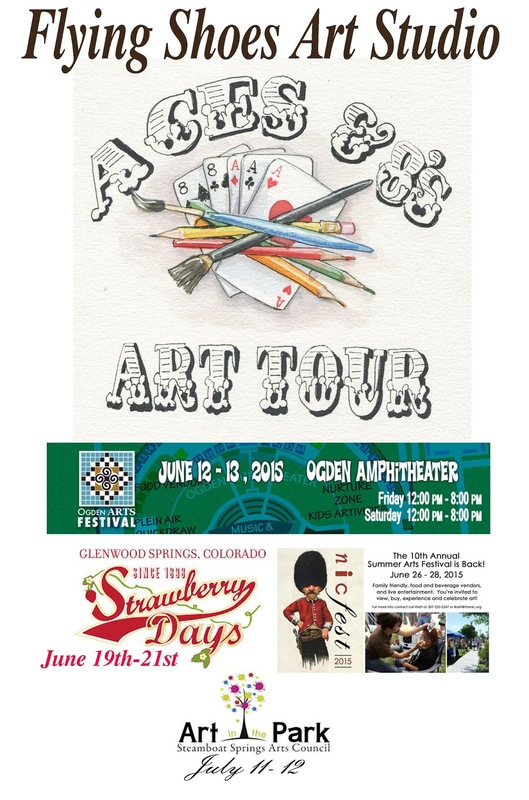 We leave Wednesday for Ogden Utah then travel back into Colorado for the well established Strawberry Days art show in Glenwood Springs. The following weekend we are in Casper, WY. 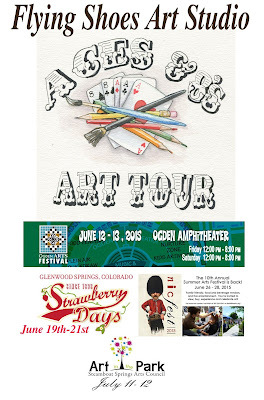 We actually get to come back home for a few weeks before we drive back into Colorado to Steamboat Springs for their Art in the Park event. In between shows we love to explore and enjoy our surroundings. We are digging for fossils a few days in Utah, gonna spend a few nights in Las Vegas and plan to revisit Mount Rushmore and other South Dakota sights. I'll post some of our adventures and try to reserve most of my vacation pictures for the poor souls who follow me on Facebook. The next few days will be spent framing new work, mounting prints and loading far too much stuff in our jeep. If you are anywhere close, please drop by and see me. It is amazing how friends I've never met but who follow me here and on Etsy or Pinterest take the time to come visit when I am close. I am so honored.